To kick off my recent NorCal trip, I paid a visit to one of SF's latest and greatest newcomers, Matt McNamara and Teague Moriarty's Sons & Daughters, located in the City's TenderNob district. The Animal-style duo, almost unknown prior to the opening of the restaurant, have made quite a splash in the past year or so with their product-driven, progressive Californian cuisine, which many look toward as the future of Bay Area cooking: that is, the blend of modernist concepts with a firm commitment to "farm-to-table" ideals (as evinced by their one-acre farm in Los Gatos, tended by Cacye Hill). The two actually met in culinary school in 2004, reportedly a result of their shared interest in home brewing. About the Chefs: A Bay Area native, Matt McNamara attended the University of Colorado at Boulder, and also began his professional kitchen career at about the same time, working as a baker at the Grana Bread Company in Carbondale, Colorado. This was followed up by an internship at the well-regarded Montagna at The Little Nell in Aspen, and later a stint at the famed Eleven Madison Park in New York, under Daniel Humm. He studied at the California Culinary Academy, and following graduation, worked the line at San Francisco's Poleng Lounge. In 2006, McNamara moved back to Carbondale to serve as Sous Chef at Restaurant Six89. 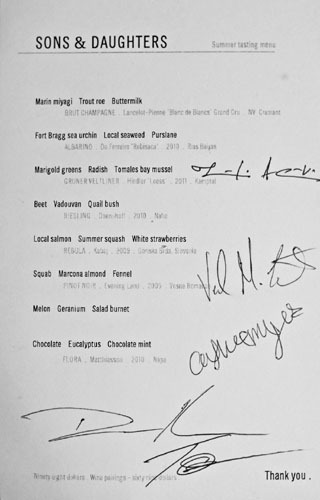 He stayed there for two years before leaving to stage in Europe, landing at Dal Delicato in Naples, Italy; the Michelin three-star L'Arnsbourg in Baerenthal, France; and Vincents in Riga, Latvia. Upon returning Stateside, McNamara apprenticed at both Alex and Guy Savoy in Las Vegas, and then at Jean-Georges' eponymous flagship in NYC. He then returned to Northern California and became a private chef before starting work on his own restaurant. Teague Moriarty, for his part, also hails from NorCal, Santa Cruz in particular. He too began his culinary career as a baker, at Emily's Bakery in his hometown, and also worked at the City's Whole Foods. Like his partner, Moriarty attended the CCA as well, graduating from the school in 2005. Following, he began cooking at San Francisco's Limón Rotisserie, then moved to B Restaurant & Bar across the Bay in Oakland. Moriarty later secured a Sous Chef position at Gregoire in Berkeley's famed Gourmet Ghetto (the home of Chez Panisse). He left in 2009, however, and began working as a private chef, all the while planning Sons & Daughters with McNamara and honing his modernist techniques. Along with co-owner Travis Curtis, McNamara and Moriarty debuted Sons & Daughters in June of 2010, in the building formerly home to Fredy Fahrni's Cafe Mozart. Just three months later, Michael Bauer dropped a solid 2.5-star review in the SF Chronicle, a rating that was upgraded to a full triple a year later. Michelin, meanwhile, also granted the Chefs a star, and the restaurant enjoyed good press from Bon Appetit and GQ as well. Business was (and is) booming. 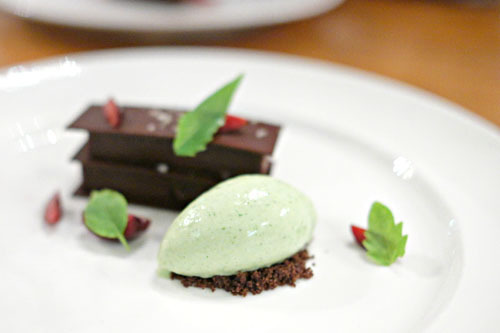 In 2011, they brought on a full-time pastry chef from Boston, Kevin Gravito, and laid plans for Sweet Woodruff, a casual take-out place run by Manresa alumnus Isaac Miller (it bowed in January). Their latest accomplishment? Being named "2012 Rising Star Chefs" by the Chronicle. As for Sons & Daughter's menu, it's definitely been ratcheted up a notch since the restaurant's debut. They opened with four courses at $48, plus $36 for wine, with all the dishes available à la carte as well. These days, it's an eight-courser priced at $98 (there's also a slightly cheaper veggie menu), with an additional $69 added for pairings by Sommelier Carlin Karr. Note signatures from Chef de Cuisine Duncan Holmes (ex-Saison), Sous Chef Val Cantu (ex-Benu), Tony Luangrath (ex-Saison), Timofei Osipenko (ex-Benu), and stagiare Kathy Ayers. Click for larger versions. Kicking things off was a duet of amuses. 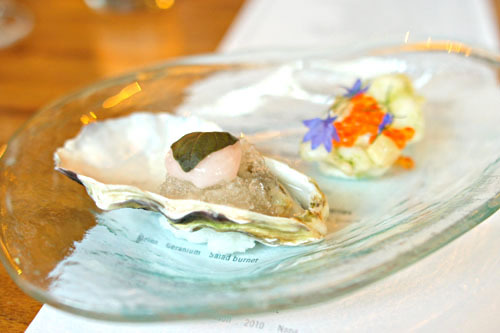 First: a lone Marin Miyagi oyster, topped with lime granité and opal basil. There was an intense (perhaps too intense) sourness up front, leading to a clean, refined brine on the finish, joined by a bracing temperature contrast courtesy of the granita. 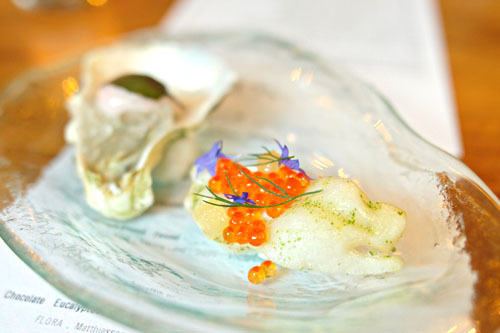 More to my liking was a buttermilk chicharron with smoked crème fraîche, green onion salt, dill, and trout roe. This was straightforward in concept but fantastic in execution, with a beautiful balance between saline and onion-y flavors, all moderated by the lush, creamy crème. Great textures, too, and lovely with the accompanying crisp, apple-y, mineral-tinged sparkler. 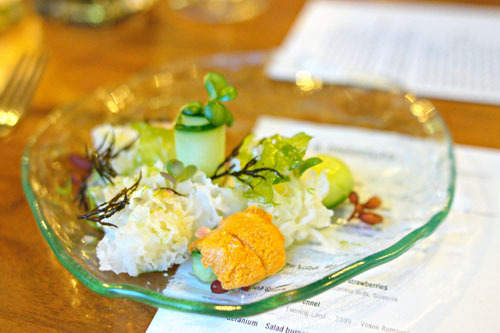 The kitchen followed up with a beautifully-composed salad, highlighting the natural sweetness and luxuriousness of sea urchin, as well as its inherent salinity. The uni was spot on, even garnering the approval of one of my urchin-hating dining companions. As delish as it was though, the tempering taste and crunch of the seaweed was crucial as well, forming a dish that really showcased the essence of the sea, tied together by an enveloping dashi vinaigrette. 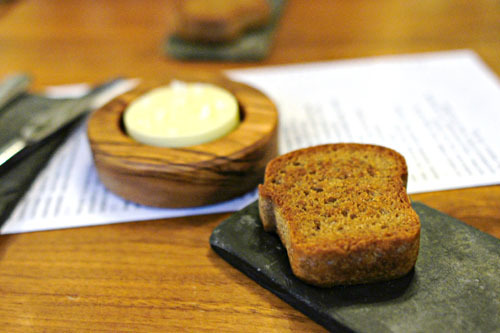 Serving as the first item of our bread service was a "cute" piece of buckwheat toast. Taken alone, I found it delightfully buttery, crisp, and delicious, but the bread was taken to another level with the application of the accompanying yogurt- and sea-salt-laced butter. 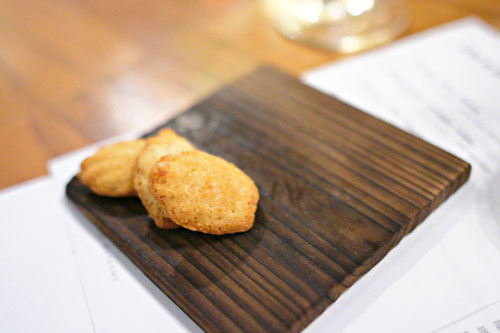 I'm quite the fan of fried mussels, and here the Tomales Bay varietals were totally on point: crisp on the outside yet wonderfully creamy and saline within--I could've eaten a whole bowl of 'em. As good as the mussels were, though, the crux of the dish was the chilled marigold gazpacho, which provided an eminently robust, citric, minty, kick-in-the-pants jolt of verdant relish, that, along with the crunchy radishes, counteracted the bivalve in superb fashion. The sheer brightness in the course was a good pair for the accompanying Grüner, with its heady dose of minerality and quintessentially strong food friendliness. 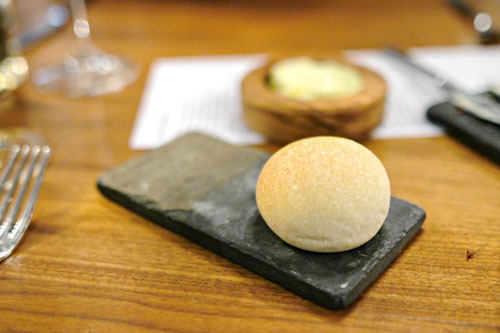 Next up was an archetypal sourdough roll, nice and tangy, rather spherical in shape, and with a satisfyingly crisp outer layer. 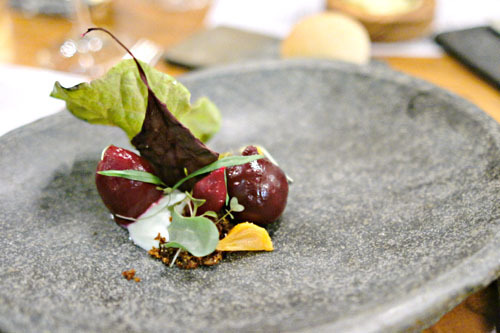 Beets were surprisingly palatable to me, pleasantly firm in consistency, their sweetness deftly offset by the creamy and vegetal components in the dish. In addition, I really appreciated the pickled mustard seeds here, and how their astringency helped to ground and moderate everything. Great wine pairing too, with the Dönnhoff showing off a classically off-dry Riesling character. 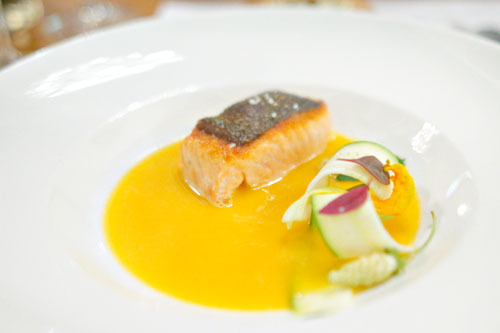 The salmon was about as flawless as they come, a perfect example of a cooked specimen. I loved its supple, yet still slightly resilient consistency, as well as its wonderfully saline flavor, amped up by the fish's gorgeously crisp, salty layer of skin. The salmon would've been heavenly alone, but the accompanying sweet and spicy fumé broth was a superb complement, accenting the fish in stellar fashion. I also appreciated the various vegetables at play here, as well as the tart, tiny strawberries present. 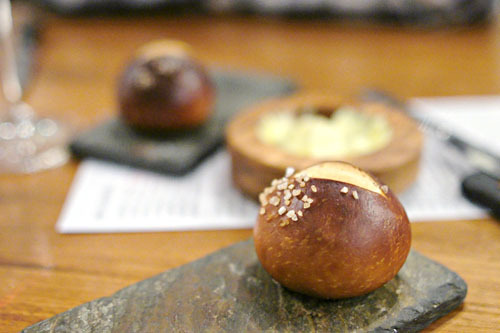 Our final bread of the evening was arguably my favorite, and perhaps the best pretzel bread that I'd ever eaten. I absolutely adored the salty kick on this one--yum. 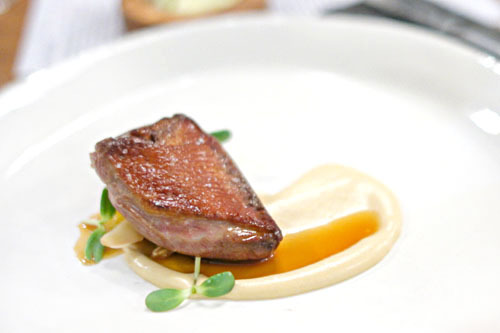 The most substantial course of the menu was this prototypically prepared sous vide squab, done to just the right temperature, making it juicy and tender, and teeming with deep, earthy flavors. Fennel, meanwhile, imparted a delicious crunch and astringency to the course, and even the juicy suprêmes of tangelo made sense. I was a bit concerned about the use of almond in the dish, but its nutty flair actually worked, too. One of my dining companions, who'd never had squab before, loved the dish upon first bite, and so did I. 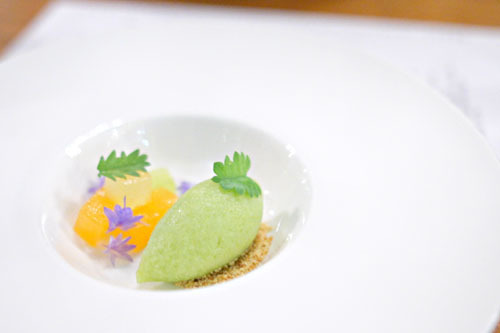 An intermezzo before dessert: the sorbet of germanium was a taste to behold, an energizing jolt to the senses augmented by the minty salad burnet, dampened in part by the sugary cubes of melon by its side. Very nice. Dinner ended on a strong note. A Napoleon of dark chocolate conveyed a saccharine, mouth-watering bitterness, interspersed with notes of mint and fruity hints of Bing cherry. Tasty. However, the star of the show was the marvelous eucalyptus ice cream, with its exhilaratingly refreshing, herbaceous flavor that played perfectly against the chocolate--a real breath of fresh air. To close: some delightfully floral chamomile-lavender madeleines. McNamara and Moriarty have got a winner on their hands in the form of Sons & Daughters. Their cooking represents a welcome evolution of a culinary scene that has moved beyond mere "figs on a plate." 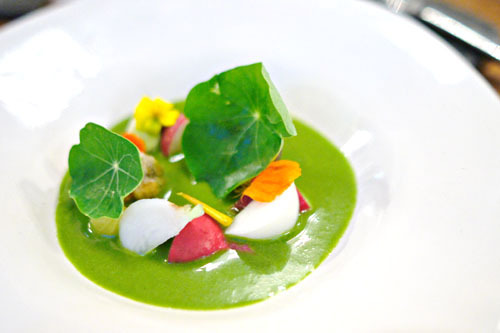 The food shows an avant garde bent, but pays homage to the farm-to-table cookery that Northern California is known for. Technique is utilized to the maximum, sure, but it's not necessarily made obvious to the diner. Instead, the Chefs are doing a bang-up job in showing us all that's great about fresh, local, seasonal product, but just presenting in a slightly new light. These guys are killing it at this point, and I'm betting that they'll only get better with time. Two stars doesn't seem too far away. Though quite happy with the meal at Sons & Daughters, we weren't quite full at this point and thus headed out to the Mission in search of the district's famed burrito. Our intended destination was the well-regarded La Taqueria, but alas, they'd already closed by the time we arrived. Downtrodden, we settled for El Farolito, where, ironically, I enjoyed not their burrito but five types of tacos: pollo, sesos, carne asada, carnitas, y cabeza. Not bad, though nothing mind-blowing. After stuffing ourselves with tacos, we headed up to Twin Peaks to catch a panoramic view of the City from Christmas Tree Point. That particularly bright row of lights is Market Street. I see more and more Veltliner served in the US. Great news for Austria. 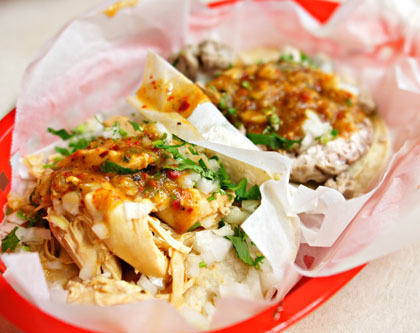 If you needed tacos after a fine dining experience it's a perfect example of fine dining overload. El Farolito rocks for late night tacos. Heck. I've even dragged my mother in there for late night tacos. Don't ask. Makes me think of that time back in the 90s when I was at Aqua. My friends and I loved the food. But we were hungry. Hit La Cumbre for burritos and all was right in the world. 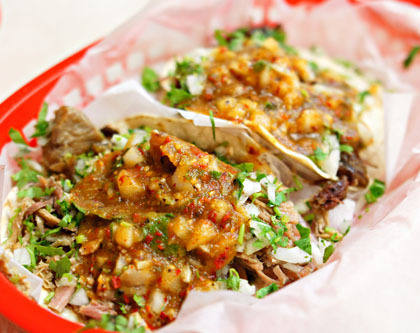 if i lived in cali, id eat tacos EVERYDAY!!!!!!!!!! That tiny piece of buckwheat toast remains one of the best pieces of bread I've ever put in my mouth. Crisp exterior leads to a fluffy, almost brioche-like interior. A wonderfully rich nutty flavor with the strong taste of good butter on the finish. I will never forget it. 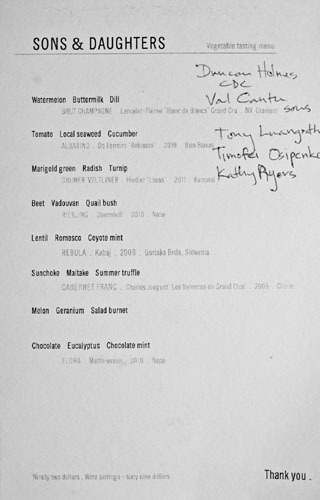 When I dined at Sons & Daughters (about 1.5 months ago), I tried both chefs tasting and vegetable tasting. At the end I couldn't decide which one I liked better. Nevertheless, I was slightly less impressed than you on my visit. I think it still deserves one star but not two. Lastly, give Saison's chefs counter a go. Given your prodigious log of fine dining experiences, I wonder if you will find Saison -as i have- to currently be the best restaurant in America. Hope all is well w u buddy. Peter: Great news for us diners here, too. Anon: Nah, it was just an example of me not being full. Happens all the time really, as I have an uncommonly large appetite. 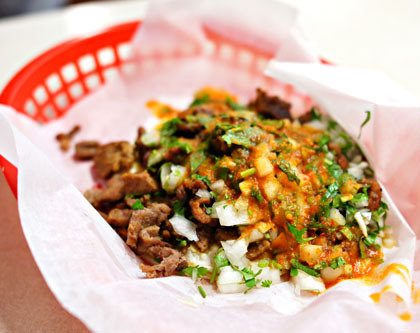 Kailyn: How does it compare to La Taqueria? Daniel: You know, now that you mention it, that toast might be one of the best pieces of bread that I'd ever had as well. 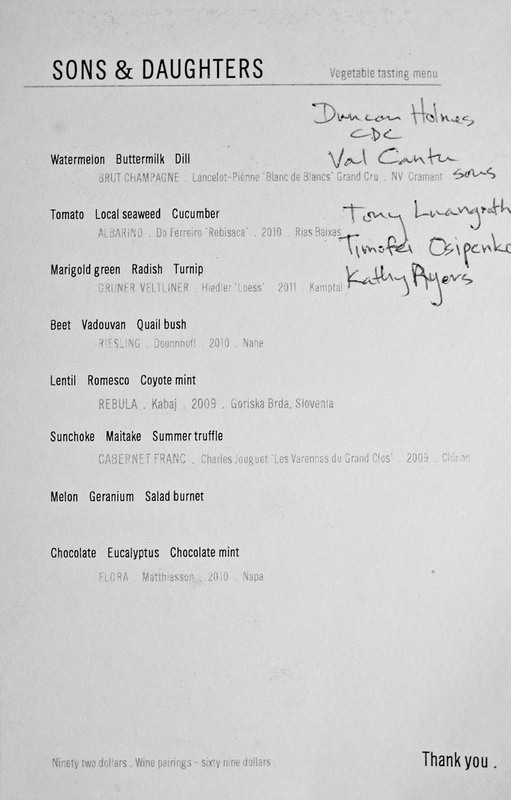 Saison was arguably my top meal of 2011, so now that Skenes has upped his game even more, I wouldn't doubt your claim! I think I'm going to try to make it back during my next Bay Area visit.